Public land abounds on both sides of M-22, including Sleeping Bear Dunes National Lakeshore and almost a dozen Grand Traverse Regional Land Conservancy (GTRLC) natural areas, providing access to trails and paths into some of Michigan’s most spectacular dune country. That includes Arcadia Dunes, a GTRLC preserve that saved one of the largest remaining undeveloped tracts of Lake Michigan coast when it was established in 2003. Also known as the C.S. Mott Preserve, Arcadia Dunes is spread across 3,600 acres just north of the Manistee/Benzie County line and is spilt in half by the state highway. The preserve includes 2 miles of Lake Michigan shoreline, coastal bluffs with impressive perched dunes, hardwood forests and grasslands. The adjacent working farms, totaling an additional 2,500 acres, have also been permanently protected, making Arcadia Dunes one of the largest conservation projects ever completed by a local land trust in the Midwest. Winding from one end of the preserve to the other is 15 miles of trails with the major trailheads conveniently located just off M-22. 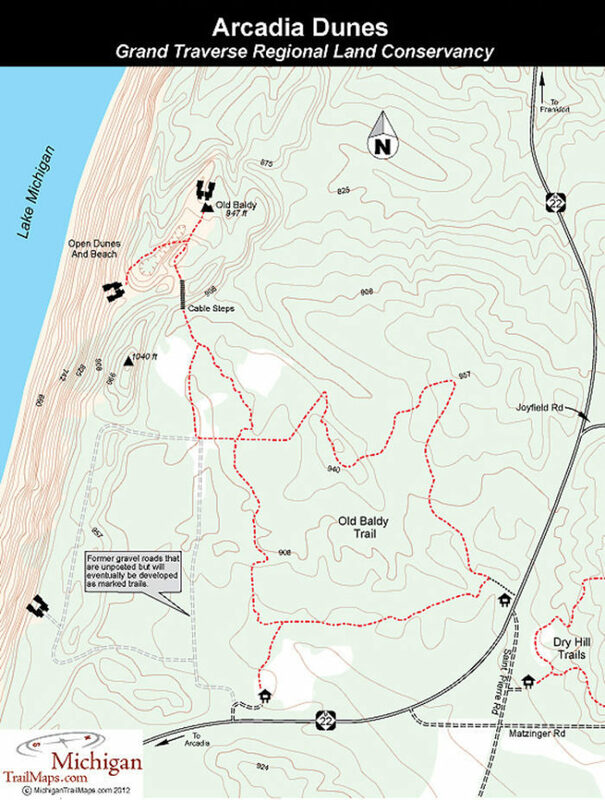 On the east side of the state highway is Dry Hill Trails, a 10-mile loop that was designed by the International Mountain Biking Association and has become one of the premier off-road rides in Northern Michigan. 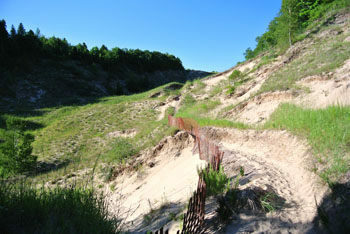 On the west side of M-22 is Old Baldy Trail, a 3.7-mile network that leads to sweeping views on top of a perched dune. Another part of the preserve is Pete’s Woods Trail. Reached from the Swamp Road Trailhead, this 1.5-mile loop winds through a heavily forested area with moderate climbs. The impressive hardwood forest makes this easy hike a favorite in the fall while a fusion of wildflowers will bring you back in April and May. At the trailheads are parking areas and information kiosks but no toilets or drinking water. 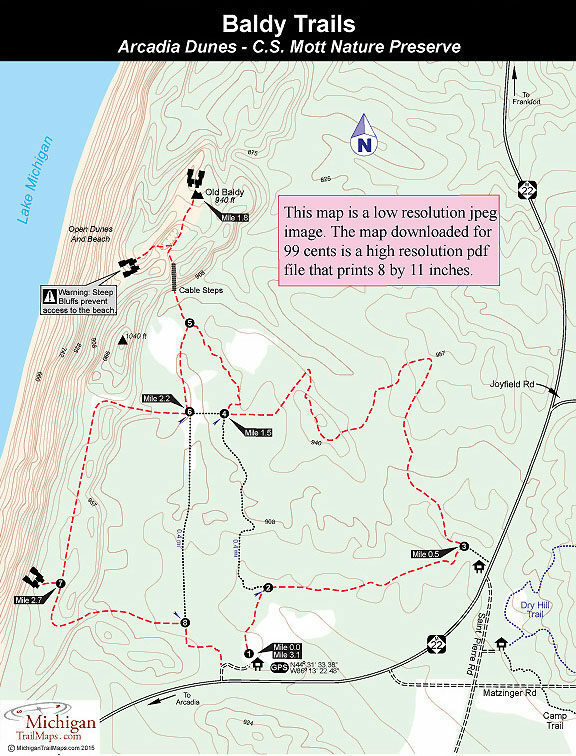 Baldy Trailhead is posted along M-22, 8 miles south of Elberta or 2.7 miles north of Arcadia. If heading south, the trailhead entrance is on the west side of the state highway, 0.7 miles south of Joyfield Road. To reach the Saint Pierre Trailhead turn onto Saint Pierre Road — Dry Hill Trails is posted along M-22 a quarter mile south of Joyfield Road. The parking lot is 100 yards south along the gravel road. 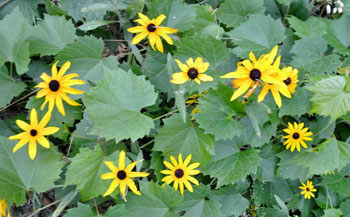 Pete’s Woods Trailhead is posted along Swamp Road a quarter mile south of Joyfield Road and 3.5 miles east of M-22.